Matt grew up in the Cadillac area and moved to Grand Rapids in 1984. In 1987 he began working in the construction business and worked for several builders in the area. In 1993, Matt become self-employed and in 1994, he returned to the Cadillac area and has been a general contractor since then. Matt joined North West Michigan Home Builders Association soon after and was on their board of directors for six years. He served a two-year term as president of North West Michigan Home Builders Association. Matt was involved with bringing the Parade of Homes to Cadillac in 1996 and has had five homes in the Parade. Matt served on the Parade of Homes committee, as well as the Camp Torenta committee, formed by local builders to volunteer for building improvements at a local youth camp. 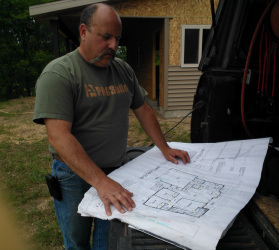 The main focus of Matt's business is to build custom homes, remodeling projects and home additions. Many of his homes have been built for clients residing downstate and out-of-state who either retire to the Cadillac area or want vacation homes here. It is very important to Matt, as a small business owner, to stay active in our community and to promote local growth. Cadillac is a wonderful community to live in, with many opportunities for outdoor recreation in all seasons and a great place to raise a family. Matt would be happy to provide references from previous clients upon request.